Until just recently I lived and worked in a tiny house on wheels. At just under 200 square feet (including the loft), it was a great exercise in living minimally and really deciding what things are important to everyday life. Living in the tiny house inspired my first quilt project, a tiny house quilt block made into a pillow. I had absolutely no quilting experience before I started. But through trial and error and a little bit of googling, I figured it out enough. Pretty good resemblance! :-) I see so many things I’d do differently now. But I think that’s part of the charm of it. It’s a wonderful reminder of my tiny house years and the beginning of my quilting adventure. This little table was where I did my sewing and blogging. We found a table that expanded when needed, so I actually had quite a bit of room! I stored my machine in a cupboard and had one shelf in the closet dedicated to my fabric. My cutting mat, ruler and ironing board hid in the closet behind a row of clothing. Having one shelf only for my stash really made me take a hard look at the fabric I used and reached for every time I had an idea. I realized I loved solids, polka dots, essex yarn dyed linen, small florals and stripes. Although I made exceptions for those special fabrics that just grabbed my heart strings, I tried to stick to my list. I discovered if I bought something just because it was on sale or because everyone else was using it, it just sat on my shelf. What types of fabric would be on your list? If something has been in your stash a really long time (whatever that means to you), it might be time to say goodbye and make room for something you will love. I totally understand keeping treasured fabrics around to admire, but ask yourself why it’s still sitting there. Perhaps it’s time to make that project you’ve been putting off. Maybe you have a friend just starting out that would love it. Maybe you could make a few bucks destashing it. If nothing else, taking a look at what is collecting dust is a good exercise in making sure your stash is something you can actually work from. Although I have yet to do this in my new sewing space, painting your walls white can brighten your space and give you extra light. White walls reflect the light and will make your whole space lighter. In addition, white walls give the illusion that a room is bigger. These are both great ways to maximize a small space! I love the look of your tiny house. My son & his girl friend would love to build and live in one. Right now they have to make due with 'tiny expensive apartment'. I think you are right about fabric in your stash. Mine is undergoing a major overhaul right now. Thank you! They are a great way to get out of an expensive living situation (that's what motivated us) but it is hard and scary to make that leap. We were lucky enough to have relatives that let us live on their property so it really kept the costs down. 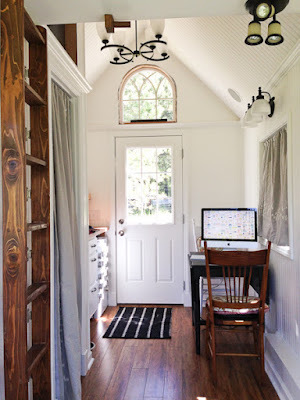 What a great little house - it looks like fun - although - I might have taken over the whole space - I like to spread out. Will try your ideas!! I'm fascinated by the idea of tiny living, but even more fascinated at the thought of a quilter doing it!! Whenever I try to imagine myself living tiny, it's always my quilting that stops the daydream. I have a dedicated room with a large table, a large ironing surface, and a design wall. My stash isn't that large, but it's my comfortable accommodations I'd struggle to give up. How much would I even sew if I had to clean it all up every day before dinner! Great tips for whatever size of sewing space you have. The sales bargains that were so tempting often do linger..... Like your other readers say the tiny house is such a lovely idea but maybe just for two, I guess it wouldn't be so easy now you have your daughter! I think my fabric stash (which luckily does not have to be particularly limited now!) would include batiks, geometrics/abstracts, tone on tone, and some solids and low volume prints. There are definitely fabrics in my stash from an earlier time that would not make the cut now! I've been fascinated by tiny house shows, and yours is beautiful. How long did you live in it? One thing I have wondered is on average how long people stay in tiny houses - whether it is something that works for certain phases of their lives, but not for others. Since in my part of the world almost everyone lives in pretty small flats anyway, I love to see how space is maximized in tiny houses. Thank you for all the helpful tips. My tiny home is a 38'x8' 5th wheel RV. My fabric stash is taking over and I need to get it under control and you have inspired me to do just that. Wonderful article. Glad to found your blog, Thanks for sharing this post.